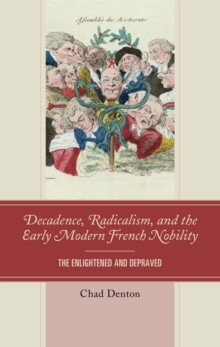 The image of the debauched French aristocrat of the seventeenth and eighteenth centuries is one that still has power over the international public imagination, from the unending fascination with the Marquis de Sade to the successes of the film Ridicule. Drawing on memoirs, letters, popular songs and pamphlets, and political treatises, The Enlightened and Depraved: Decadence, Radicalism, and the Early Modern French Nobility traces the origins of this powerful stereotype from between the reign of Louis XIV and the Terror of the French Revolution. The decadent and enlightened noble of early modern France, the libertine, was born in a push to transform the nobility from a warrior caste into an intelligentsia. Education itself had become a power through which the privileged could set themselves free from old social and religious restraints. However, by the late eighteenth century, the libertine noble was already falling under attack by changing attitudes toward gender, an emphasis on economic utility over courtly service, and ironically the very revolutionary forces that the enlightened nobility of the court and Paris helped awaken. In the end, the libertine nobility would not survive the French Revolution, but the basic idea of knowledge as a liberating force would endure in modernity, divorced from a single class.